Pharmacies are required to be licensed to dispense to patients across state lines. In order to keep up with this, as well as the expiration dates of the license, there is a new check in GuardianRx for states licensed for dispensing as of our latest release. Claims will fail adjudication if the store is not licensed to dispense to the account’s shipping state (for Order Management). GuardianRx checks the Home Address state for Retail. 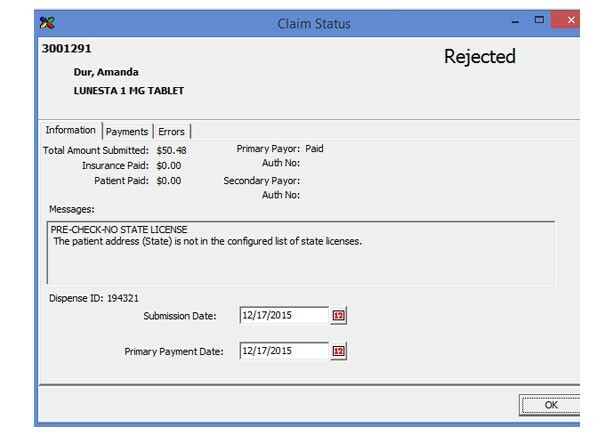 When the “Reject Claims When License is Expired” option is flagged, the claims adjudication logic will look for the state and the license expiration date to continue the adjudication. This is an internal check just like a variance reject. If the state is not listed, it is assumed to not be licensed. If the state is on the listing but the license expiration is not flagged, the system assumes that there is no expiration date. To add, click New or to edit a state license, highlight and click Open. If there is no expiration date then uncheck the expiration box so that claims can continually be adjudicated. Otherwise use the expire date to limit when the license is effective. Just prior to adjudication, the system will check the shipping state (or home state for retail pharmacies) of the patient on the prescription. If the pharmacy’s license for that state is expired or the system doesn’t find the state license, the claim will fail adjudication and appear as a rejected claim in the claims queue. 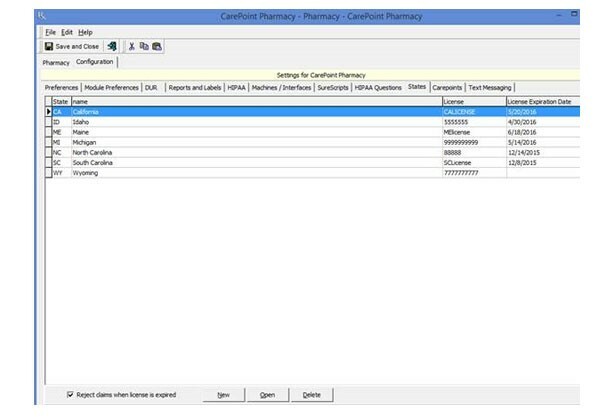 As more state and federal requirements continue to enter the pharmacy arena, CarePoint strives to add features that help you get through them successfully. If you have any suggestions on what could help your pharmacy email us at newsletter@carepoint.com.